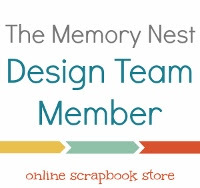 I created this page for the design team call over on the Memory Nest. 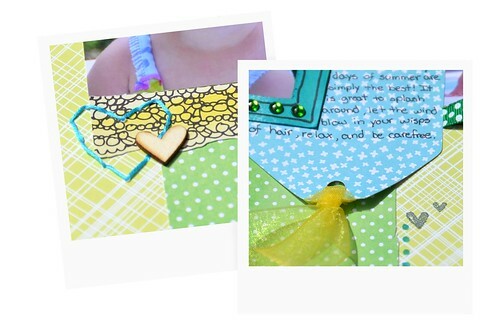 The yellow, blue, and green colors remind me a lot of my childhood bedroom, so bright and happy. My background paper is from echo park's everyday eclectic. 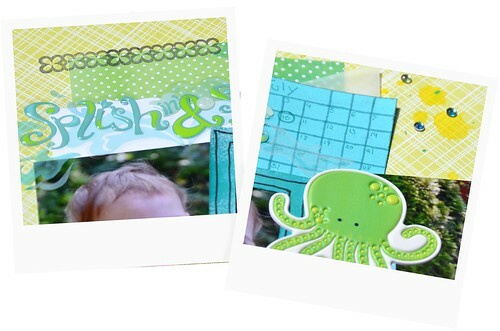 I also used up a bunch of scrap paper bits I had from Amy Tangerine. I really wanted a frame around the middle photo but couldn't find anything that worked so I made it with just some light blue cardstock, a little misting on top of it, and a few doodles. I found the Splish sticker in my stash. I have had it for years and finally got the chance to use it. The little blue calendar I made from some plain old blue cardstock. I also used some misting and some sparkly jewels because they reminded me of bubbles. I love adding some sparkle to a page! I also added a little stitching with the heart and added a wooden veneer one too. I have had such a hard time getting my hands on any wooden veneer pieces, but I finally got my hands on some cute hearts and arrows. No stores by me carry them and all the ones online seem to be out of stock constantly. I love the look of the raw wood! I also stamped a few tiny hearts onto the page too. You can never have too many hearts on a page. Beautiful layout. Love the colors. Green and yellow are so pretty but can be so hard to work with. You did a wonderful job.